Don’t Put Out the Fire in the Prometheum Ceremony! Yesterday, the college marked the Prometheum Ceremony, in which Year 6 CCA Leaders handed over the mettle of leadership to their Year 5 successors. As we commemorate the formal transition of leadership, it is worth looking at how this exercise can be improved in future years. Here is the wish-list of this correspondent for next year’s Prometheum Ceremony. To begin with, the date of Prometheum Ceremony ought to be brought forward in the school calendar. Given that most Year Sixes step down from their CCA duties in April to prepare for their A-level, it makes little sense to wait four months before conducting the ceremony. This diminishes the authenticity and excitement of the event as a bona fide inauguration. Next, we ought to re-examine the actual proceedings during the ceremony. In order to do so, we must first ask ourselves, “What is the purpose of an investiture?” If the goal is to increase the visibility of student leaders and allow students to familiarize themselves with the CCALs (ostensibly our “role models who serve by leading and lead in serving”), then it is futile to conduct the handover en masse. More fundamentally, an induction should be about creating the sense of occasion and gravity which is so vital to affirming the confidence and faith of a young, wide-eyed, incoming CCAL. Calling CCALs up one-by-one may be a tedious and painful process, but the effort is worthwhile if we genuinely want to appreciate the contributions which our Year Sixes have made, and cheer on their counterparts. As at Year 1 – 4, steps can be taken to reduce the monotony. For instance, CCAs could hand over their own customized symbols of leadership (for instance, a gavel for the – you guessed it – Gavel Club!). CCALs could even be dressed in their respective CCA attire and costumes! Alternatively, the Prometheum Ceremony could be decentralized into different CCA clusters – for instance, the sports teams could have their ceremony at the stadium, while the musical groups could hold theirs at the Performing Arts Centre, with their members in attendance. Although the formality of a full school assembly would be lost, this would give individual CCALs more airtime and attention. “We, the CCA Leaders of Raffles Institution, pledge to uphold the values of this Institution. We pursue excellence with fortitude, integrity, respect, and enterprise. As elected representatives of our CCAs, we will be role models who serve by leading and leading in serving, making a positive difference in our communities. As such, it might be helpful to consult both staff and students in the drafting process, such that there is more buy-in, rather than allowing the oath to resurface once a year as yet another catchy slogan or tagline It could even be a starting point for real and valuable discourse about the role of a student leader in RI (“What does it mean to ‘pursue excellence with enterprise’?” “What does it mean to ‘lead in serving and serve in leading’?”) Avoiding clichés and including genuine and authentic input would be a first step. In sum, every ceremony, every assembly has the potential to turn into a special moment for the school to rally together. Whether we convert the try is another matter altogether. As the school year draws to a close, it is time for us to relight the flame in the Prometheum Ceremony and make it count. Eagle Eye preview: read all about human chemistry at Raffles International Science Camp 2012.
Who says Rafflesians are Selfish and Uncaring? Eagle Eye preview: we explore unique, innovative student-initiated service projects by Rafflesians. I’m confused, is it mettle, mantle or helm? 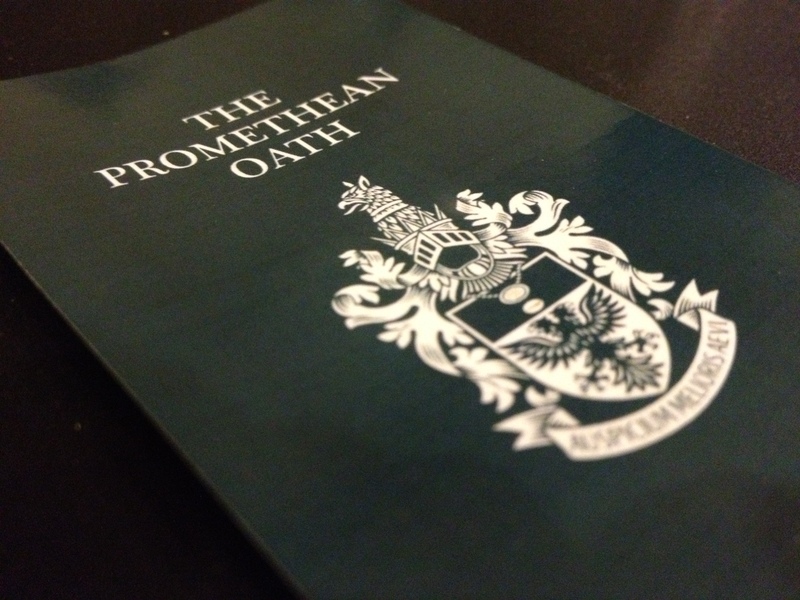 Or Promethean Torch? (as implied during the ceremony itself – with real fire! Woah~) They are all highly differing abstractions of the leadership role after all; mettle means courage and fortitude, a mantle is a cloak (or a later of the earth’s core), the helm is a medieval helmet or (more probably) the post of control in a ship, and a torch is, well, you know, like the olympic torch. I just don’t know which symbol to ascribe to my noble CCA leaders – every time I look at them I get conflicting mental images. I wish Corp Comms would decide on a consistent metaphor. Agree with the clichedness of the oath but recognize its necessity in moulding a leadership culture. However, it does seem as if they just squeezed all the trademark Rafflesian leadership taglines (is it just us, or do other schools use any taglines we haven’t taken?) into two or three lines. Just a few years ago, both of these were still the case, and it was quite grand. Sigh, what’s happened since then?